Ever since I read Eat Pray Love by Elizabeth Gilbert, I knew I needed to go to Bali. I had been curious before, but her description of the country led me to believe that it was something to be experienced in real life, not just through a book. So, like droves of others, I took off to explore this distant land and came away with some tips that I’d like to share with you here. Don’t take the taxis waiting at the Airport – they are a total and absolute rip off! Instead, go just outside of where all of the taxis are lined up, and into the parking lot. Look for the light blue taxis that are “Blue Bird” taxis. They will charge you by the meter, and not take all of your money! You can also call them for reservations, schedule pick ups from the airport, or find general info here: Bluebird Taxis (official site). Depending on the season, it may be better NOT to book your hotel in advance. Many of the online hotels can be deceiving about their proximity (and quality!!). I found it better to go to the area you want to be, check out what is near by, look at the rooms, check the internet connection, and barter for a price. You can usually get a much better deal in person than you can with online reservations! If you want to check availability and prices for Bali hotels, see Booking.com – read the reviews from previous guests carefully. Bali is definitely a place where you need to barter. Unlike other countries where the locals seem willing to ask just a bit more than the real price, Balinese are apt to ask you several times the price for clothes and merchandise. Rule of thumb: if you are in a marketplace, you can barter them down. Store prices are more difficult, but can be done. When you’ve offered a fair price, and they say no, Walk Away! Usually, they will come running after you and let you have your offer. It is all part of the game, so go with it, and get your barter on! Bali Beaches near Denpasar Airport are Sanur Beach and Kuta Beach. 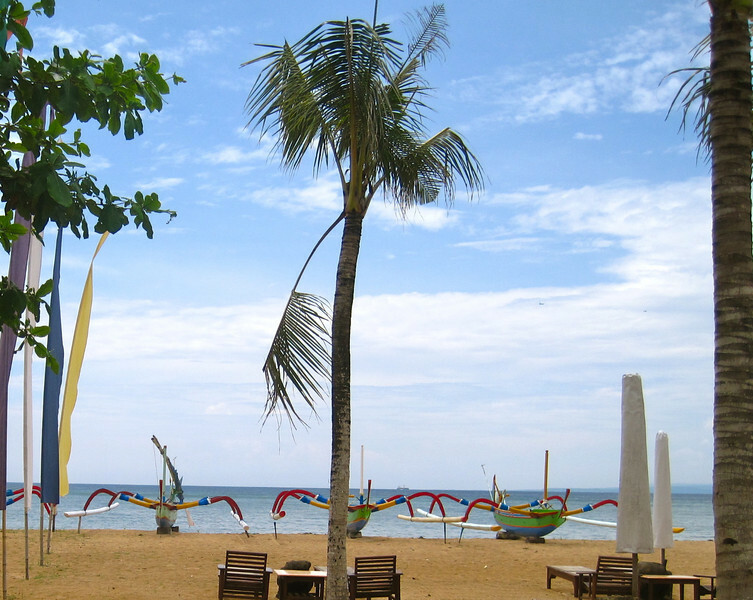 Sanur seems more for the vacationers, where Kuta has a lively backpacker scene. Further up north there are deserted stretches of black volcanic sand beaches, like Pemuteran. Many people just travel to Bali for the beaches, and if you are feeling adventurous, try checking out the Gili Islands or Komodo island, home of the infamous Komodo Dragons. Those are on my list for my next trip, for sure! My favorite part about my trip was going off of the beaten path and taking a tour that not many people have had the ability to do. 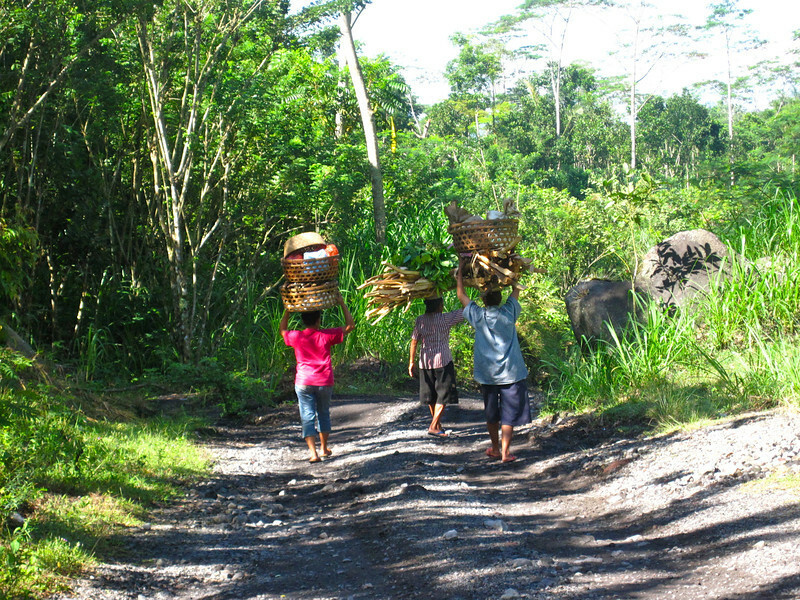 Nyoman has started taking people to the village where he grew up. I got to get close up views of Mt. Agung, learn about the rice fields, visit his family compound, and witness traditional music played by his family. 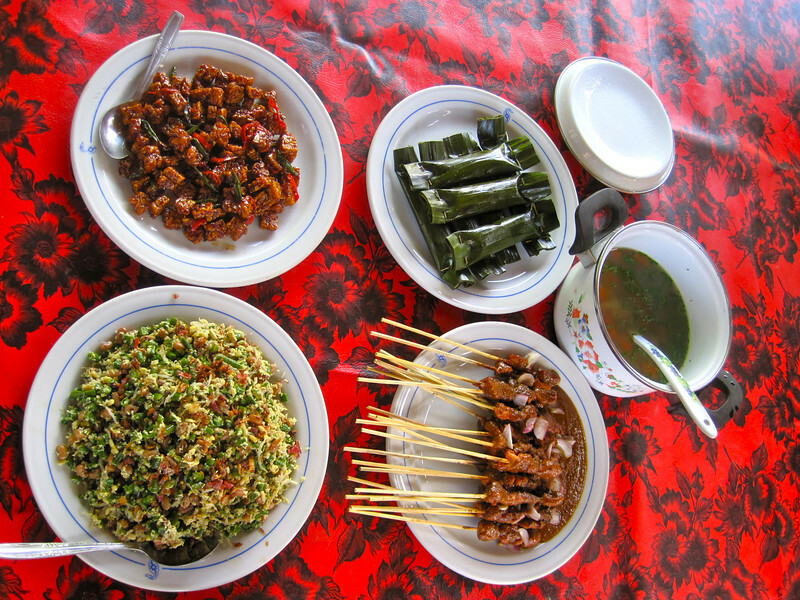 Traditional Balinese foods are similar to most Asian dishes, consisting primarily of rice or noodle dishes. The meat dishes are wonderful marinated barbeques complimented by small salads or portions of pickled vegetables. I did not have any problems eating the traditional food, and found that while it was well flavored, it was not spicy. Be sure to try the sates (marinated bbq meat), lawar (mixed chopped vegtebles and spices), and lampet (snack served wrapped in banana leaves). The soups are also wonderful, so make sure to try them too! One of the most exciting parts about Bali is that there are temples literally EVERYWHERE. You can go in to them, take a look, and be a part of the music and festivities. However, it is recommended that you wear proper attire. Women should have on sleeved shirts and covered legs. Men are fine with standard sleeved shirts and shorts are acceptable. Most temples will provide wraps, or there are women selling sarongs outside for you to go in. If you are staying in or outside of Ubud, you definitely need to check out the Sacred Monkey Forest Ubud Sanctuary. It is full of beautiful sculptures, outdoor temples, and the monkeys are everywhere! Mt. Agung is a must. Get picturesque views from restaurants or visit the mountain up close and personal with a guided tour. My last advice is if Bali is somewhere you really want to go and you have always dreamed of traveling, buy a ticket, and go it alone. I waited around a long time to coordinate tickets, plans, and eventually just decided to go on my own. 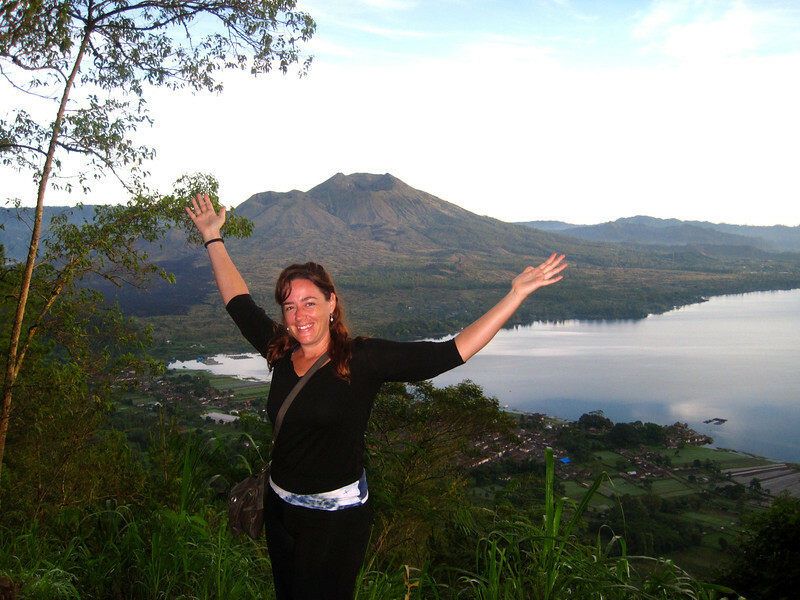 Bali is a safe island, with lots to do and explore, so don’t be afraid, all you have to do is buy a ticket and go!! Brooke has been traveling the world and living abroad for the last two-and-a-half years. She consults others on how to create and run an online business from anywhere in the world.